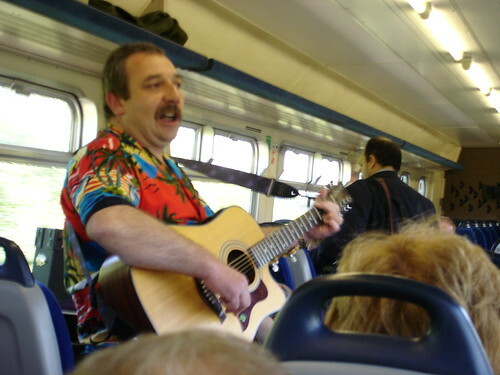 For Steve's 41st birthday we took a journey on the Folk Train. This is a regular train from Manchester to Hathersage in the Peak District but with the added bonus of musicians playing in one of the carriages. On our trip I was treated to a chorus of Happy Birthday sung by the entire carriage. (Thanks Sophie!) The stopover in Hathersage included a visit to a local pub where the musicians played on and the punters availed themselves of lunch and a beverage. It was a great way to spend a summer afternoon. You can read more about the Folk Trains here. On our return to Manchester we took a trip to Urbis before retiring to our abode. On Sunday we took a trip to Martin Mere Wildfowl and Wetlands Trust in Lancashire. You can read more about Martin Mere here. You can see a few snaps from our trip on the Folk Train here. There is some video from the train here (9.6 MBytes). There are a few snaps from Martin Mere here.